[page 211] Only for a certain limited time can the human being be studied from the philosophical standpoint. Further into the past, and further too into the future, extends the age when man can be considered from the standpoint of theosophy. Transcending both, and probing man's being to the uttermost, is occultism. For behind all human knowledge whatsoever stands occultism. Occultism is the oldest of all; it has the longest age of time. Before theosophy was, was occultism; after theosophy, occultism will still be. Before philosophy was, was theosophy; after philosophy, theosophy will still be. Why is philosophy in such a prominent position in our materialistic epoch? Because [page 19] "philosophy makes use of the thinking and means of research that are bound up with the brain and with outer perception." Thus Steiner warns us early on in this book that philosophers had better leave their muddy, materialistic shoes on the door stoop if they would walk into the sacred realms of knowledge to be acquired outside the physical world. 1.) Keep a vow "not to let flow into their egoistic will the results of the cultivation of the intellect." 2.) Keep a vow to "cease to judge any more the things they see on the physical plane, cease to employ in regard to them the power of judgment they have acquired with their understanding." 3.) Keep a vow to restrict "the inner soul life to memory" while allowing full play of memory and fantasy in their imagination. These vows must sound as radical to the modern ear as Francis Bacon's call to the Aristotelian scholars of his time, when he exhorted them to have "humility in the face of nature" - to learn from nature, to let nature instruct them as to her ways. If Aristotle called on us to be like spiders, spinning intricate webs of our imagination, then Bacon called on us to be like honey bees, taking substances from nature, mixing them with our own being, and producing something sweet thereby. What Steiner calls us to be is like human beings, who take sustenance from all of nature, the material and the non-material, the sensible and the super-sensible, and produce sweetness for ourselves in both worlds. If the materialistic scientists would indict a spiritual scientist who dares to bridge both worlds, let the defense state, in Francis Bacon's own words, "We cannot be called to account by the very tribunal that is on trial." The materialists study only the sensible world, and the spiritual scientists study both the sensible and super-sensible worlds. I say that those who have seen in whole cannot be accountable to those who have seen in part. Because of its failure to encompass the physical and the spiritual worlds, philosophy can create wonderful honeycombed chambers of nourishing honey, but it is incapable of providing one nourishing thought, one iota of love that feeds the spirit, up until now. 1.) The unmanifest light - light that does not betray its presence by impinging on one's retina. 2.) The unspoken word - the unasked question that is pregnant with unanswered questions. 3.) The consciousness without any known object - the sound of one hand clapping. What is there for the spiritual scientist to discover in the unspoken word? [page 57] For you the external word was but an echo, coming to you from without, of what the clairvoyant heart had itself investigated by means of pre-Earthly forces, an echo of what comes from the realm of occultism and had already been speaking to you in shadow pictures which you yourself could experience. Through the outer word you heard the inner word. In the spoken word you caught the echo of the word that cannot be spoken. Through the human language you heard what is spoken from out of divine worlds in the language of the Gods. Ah, if it were only so easy to explain what Steiner means by the third thing: consciousness without an object! Let us look at what a religious person experiences in relationship to his God: "a Being outside his world, a Being who is beyond and of whom he can by special means receive a revelation." Thus it is that religions don't allow for knowledge acquired directly and for that reason Gnosticism was declared a heresy by the church. Having laid out the very structure of mysticism, Steiner now is ready to explain why the mystic cannot attain the third state listed above: consciousness without an object. [page 83] For the moment the mystic leaves the objects of this world, he loses also consciousness itself, and another state intervenes, a kind of intoxication; he loses himself and so cannot attain to what we named as the third element of occult experience - that higher consciousness which possesses not one of all the objects consciousness ordinarily possesses and yet still is a consciousness. At this point in the book Steiner turns his focus of attention on certain attributes of human beings: they are upright, they speak, their form is symmetrical, they are enclosed within the skin, they contain organs: active, inner organs with connection to the outside world, they have an interior with no connection to the outside world, they have balance, they have organs of reproduction, they have thighs, knees, legs, and feet. As Steiner developed this sequence it seemed arbitrary but it soon became clear that this is the order of the body parts assigned to the astrological signs, from the upright forehead of Aries to the feet of Pisces. Anyone who, like me, has wondered how this correspondence was made in astrology need wonder no more. 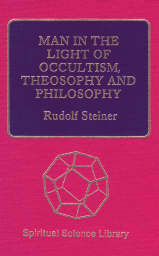 From here Steiner is able to begin his description of the three seven-fold beings that comprise the human being. By allocating the twelve attributes in order, Steiner creates the thinking Upper Man, the Feeling Middle Man, and the Willing Lower Man in the Chart on page 118. The Upper Man "is adapted to the stars, as the middle man is adapted to the Sun." Thus the ancients under influence of the Upper Man worshiped the Stars at night. The ancients under the influence of the Sun worshiped the Sun by day. But the influence of the Moon was such that during the waxing of the Moon, the ancient clairvoyance grew till the Full Moon when they knew by direct perception that they were Sun beings. Under the influence of the changing Moon, these ancient people worshiped the Moon. Most prominent of these worshipers were the ancient Hebrew people, who under Moses became Moon worshipers and worshiped Jahve. [page 142] . . . the surest and safest way for the pupil is therefore to take his start from the human form or figure. Upon the human form Luciferic and Ahrimanic forces have had least influence. Please note, I say "least" influence. They have had influence on the human form, but there least of all; a far greater influence has been exerted on the inner life of the soul. Thus contemplation of the human form is the healthiest way for a beginning student of the occult to proceed, a way that has the minimum influence of Lucifer and Ahriman. The human form is a legacy of the Earth, so once the student goes beyond the Earth existence, the human forces dissolve in death and the student is confronted with Lucifer. The student sees a view of himself as a wild, untamed dragon. Since "Venus is the kingdom of Lucifer." [page 165] - we see that Steiner has connected these three things: Lucifer, Venus, and the dragon. In his Worlds in Collision Immanuel Velikovsky described Venus as a comet, actually a proto-planet, that in historical times made several close passes to Earth, exchanging its atmospheric gases with Earth in an interplanetary plasma discharge. The heavy hydrocarbon gases from the atmosphere of Venus filled the Earthen skies with black, sinuous clouds radiating from a bright, shining, pearl-like visage of Venus. The Chinese people recorded these fearful sights in many paintings of black, cloud-like dragons breathing fire on a giant pearl. Could Steiner be describing his clairvoyant vision of these close passes of Luciferic Venus to Earth? Could Velikovsky be describing his unconscious occult visions of the same reality? And the Chinese paintings - were they clairvoyant visions or veridical renditions of physical world observations? And what about the hailing of fire and brimstone, the forty years of darkness wandering the desert reported in Exodus - during the period of time Velikovsky pinpoints as the final close approach of Venus before it settled down into its present orbit? [page 170] For as what man is today stands written in the heavenly spaces in the writing of the constellations of the Stars, so stands written there too what is yet to happen with him. That is the ground of true astrology. To anyone familiar with astrology, it should be clear that the knowledge of the twelve constellations as assigned to the human form plus the seven planets as connected to the seven movements of the human body is enough to allow one to create the whole of astrological knowledge given enough study. By this point in the book Steiner has laid out the whole of astrology and the multiplicity of ancient religions in a logical pattern that is intellectually demanding in its very coherence. [page 188] On the Moon, when He was Himself less highly evolved - for Christ also undergoes evolution - He had repelled, through the uttermost devotion of His Being to Highest Powers, all the attacks of Lucifer which at the time still meant something to him. In the material world we find that Light! is an attribute of the spiritual and has its meager expression in our thoughts, the expressible word has its source in what we call soul in the human, and the material world provides food for human consciousness. These three aspects are found also in the upper world as unmanifested light, inexpressible word, and consciousness without an object. 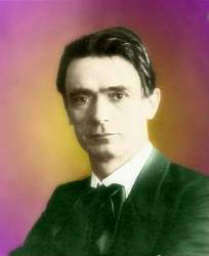 With the end of philosophy in sight, the age of a new theosophy [anthroposophy] is at hand, and the testament for the new age might be Rudolf Steiner's The Philosophy of Spiritual Activity whose goal is "to save for man that which the clairvoyant must remember at the first stage of his evolution, - the I, the self-consciousness."